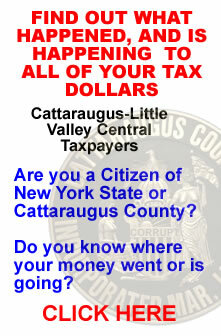 Cat County Corruption | Cattaraugus County, New York State Corruption & the Powers of the NYS Jury & Grand Jury System. 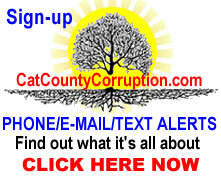 Olean Police Department Covers Up Criminal Conduct of Assistant District Attorney Elizabeth Noelle Ensell. Who Needs a Mental Exam? No Jurisdiction, No Authority to Prosecute. 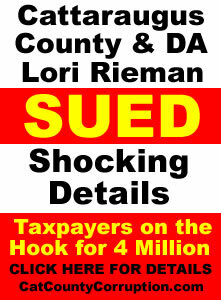 ‘DA’ Lori Rieman Proves She is a Criminal Once Again. 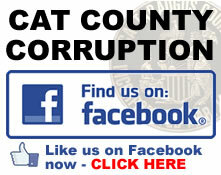 Cat County Corruption Goes Big Time! Facebook Starts to Censor it! 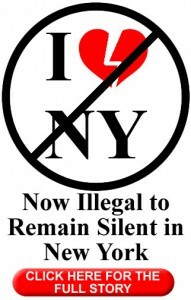 Not soon after this website came out, the Grand Jury system was placed under attack by very disturbing events, one of the most disturbing was the Eric Garner incident in NYC. 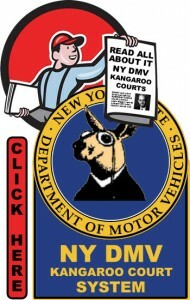 The Grand Jury system in New York is not the problem, it is those on the Grand Jury panel and New York State citizens present understanding of how it is suppose to work, versus how it should function based on it’s original intent. And let’s not forget the District Attorneys, who, like the court are mandated by law to be fair and impartial, when in fact they do the exact opposite, especially in Catt County. 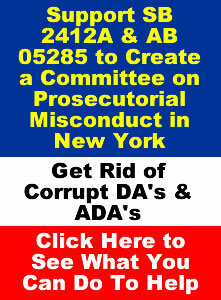 When it comes down do it, a Grand Jury in New York does not have to listen to ANY PUBLIC OFFICIAL when it involves investigating public officials. 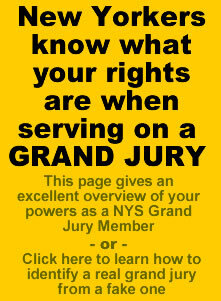 The rest of this article details the true powers of the New York State Grand jury system and how, in the past, the citizens of the Grand Juries, who understood how the system should worked, who were sick and tied of corruption, took matters into their own hands and cleaned up the the local corruption. Furthermore, the Grand Jury exists to protect citizens, i.e. We the People, from needless and unfounded prosecutions as well as to investigate crimes (see, e.g., People v Lancaster, 69 N.Y.2d 20 at 25; People v Ford, 62 N.Y.2d 275, 282; People v Iannone, 45 N.Y.2d 589, 594). CPL 190.50(5) mandates if a defendant serves upon the People, which would be the district attorney a notice that they wish to testify before the grand jury and appears at the appropriate time and place, then signs and submits to the grand jury a waiver of immunity (see CPL 190.45), the defendant “must be permitted to testify before the grand jury” (CPL 190.50[b]; see CPL 190.50[a] ). In the event that the defendant complies with those procedures and is thereafter not permitted to testify, the appropriate remedy is dismissal of the indictment (see CPL 190.50[c]). Shall never be suspended: that means in time of war, strife or whatever, a grand jury can always be seated and/or in power. Absolute: (as defined in blacks law); complete, perfect, final, without any condition or incumbrance; as an absolute bond. Information: A Grand Jury can pass down an indictment against a corrupt public official, or make a recommendation to have charges filed against a corrupt public official. In our opinion, in this age of corruption it is better that a Grand Jury indicts a corrupt public official then allow another public official to charge them. Have you ever had a “information” filed/charged against you? It maybe called a “BILL OF PARTICULARS”, or an actual “INFORMATION” (one that has the alleged accusations, alleged facts and the alleged notice all included). Hint, look to the left side of the ‘charges’ does it have “ACCUSATIONS”, “FACTS” and “NOTICE”? Is your county’s grand Jury doing their job? If not, remember, as the clause states; “the power of the grand jury shall not be,,,, impaired by law“ when investigating wilful misconduct by public officers. In other words, grand juries in other counties can investigate public officers as to what is happening in another county and they can throw the “prosecutors” out the door if they feel they are not doing there job. It has happened before, right here in this state. How honest is your counties grand jury system, is it truly independent or is it controlled by the ‘boss hogs’ of the county and filled with family members and cronies that will do the bidding of the ‘powers that want to be’. If so, are there solutions to this problem…. Originally in the early years of this nation, all grand juries were what would be considered today as a runaway grand jury. They owed no allengince to the government or its agents, they could do whatever they wanted to ensure justice was served. As government power grew, rules and regulations attempted to push them to the sideline. However the powers of the grand juries are still effective and can work well, and still are working well in this state. 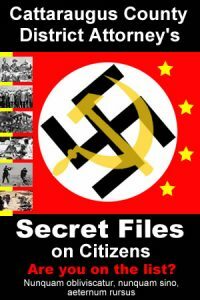 In the 1930’s grand juries were handing down bills of “indictment” in New York City, they soon discovered that their “indictment’s ” were not being carried out, so they kicked out the DA’s and the rest of the ‘government’ public officials and then proceeded on their own discoveries and cleaned up NYC. 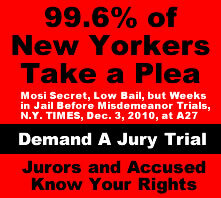 As recent as this century, grand juries are still being used effectively in New York City, where accused individuals are being placed in front of them and they are being no-billed because, unlike the rigid requirements of a jury trial, where accused individuals fairing depends upon how good of a job those representing do, they can speak there mind with no ‘legal’ interference. See these historical stories on the subject here and here. A good synopses titled “If it’s not a runaway, it’s not a real grand jury”, on the powers and history of the grand juries can be found here. Here is another article here, however, this article discusses CPL 190.75(3), which does not apply in the cases of public officers. 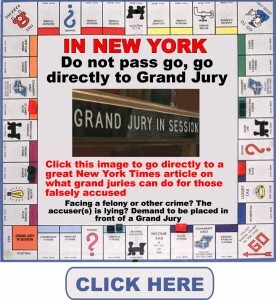 Here is the New York State Grand Jury manual – click here, and remember, whenever it references a law, just remember “the power of the grand jury shall not be,,,, impaired by law” when dealing with public officers. Section §6 of the New York State Constitution provides some VERY powerful weapons available to the grand jury, one of which is found in paragraph one, its called the “waiver of immunity” and the failure to answer questions. Paragraph 1 is found below, read what it says, it’s totally amazing. In other words, if a public official refuses to sign a waiver of immunity (this keeps the public official from being charged with anything he testifies too, it protects him for telling the truth), or they fail and/or refuse to answer any relevant questions they lose there jobs. How Do You Get Your Issue in Front of a Grand Jury? The clerk of the courts is one method, create an affidavit and send a true, correct and complete copy of it to the clerk of the courts, with a cover letter briefly explaining why you are doing it, via certified mail, restricted delivery, return receipt requested. UNIFORMED RULES OF COURT: Section 200.13 Impaneling of grand juries. There shall be a grand jury drawn and impaneled for such terms of a superior court as may be provided on the annual schedule of terms established by the Chief Administrator of the Courts. Whenever the public interest requires, additional grand juries may be drawn and impaneled as authorized by the Chief Administrator. For non-public officials. Caveat: You better be telling the truth and have the evidence to back it up. On the outside of the envelope place the wording “Emergency Request to be Heard Before the Grand Jury”. Then when you receive the return make a copy of the side in which the person authorized signed it and attached it to a “Affidavit of Service” that you create and then send that to the clerk of the courts and anyone else you believe needs to see it, along with a true, correct and complete copy of the original affidavit. Don’t hear anything back in 30 days? Start sending it out to other counties with another affidavit stating the grand jury of the county you reside in has not moved on your issues.